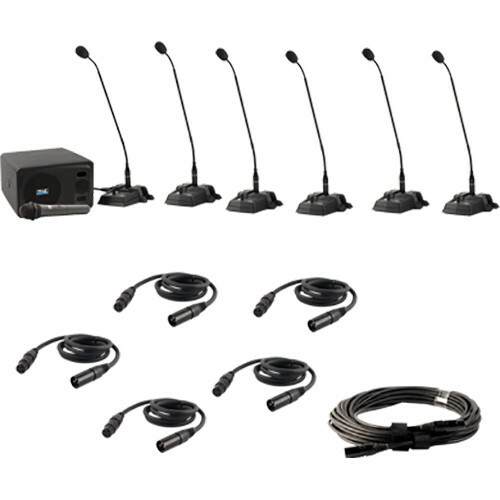 The Anchor-Audio Councilman CM-6W Conference Microphone Package is a self-contained, multi-microphone conference system, compiled to accommodate 1 chairman and 5 delegates, and address an audience of up to 100 people. The system includes a wireless handheld microphone, 1 chairman microphone and 5 delegate microphones that are daisy-chained using the included XLR cable. The AN-100CM amplifier speaker features a built-in wireless receiver, level and tone controls, and a powerful 30 watt amplifier that can easily address up to 100 people. The entire system is easily stored and transported in its durable foam-lined case. Box Dimensions (LxWxH) 25.0 x 20.8 x 10.4"
Councilman CM-6W Conference Microphone Package with Wireless Mic is rated 3.0 out of 5 by 1. Rated 3 out of 5 by Technology Director from System works fine, but a little misleading This system is easy to setup and functions well. I would say it is a bit misleading to characterize the padded cardboard box this portable system arrives packaged in as a study foam lined case. I expected at least a bag or a hard sided plastic case for a $2,500 system. Can the receiver/speaker unit be integrated with house audio? Does it have a line output? Yes there is a Balanced Line output. Can additional microphones be added to this system? How close do you have to be to the microphone? Can multiple people share 1 mic? If multiple people are using the same mic, I suggest getting as close as possible. Each delegate mic will have its own volume control.